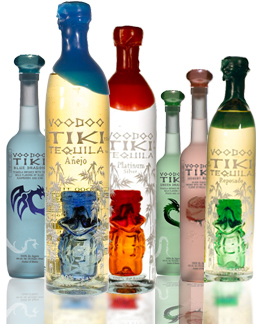 Voodoo Tiki Tequila offers a full range of high-concept, high-quality Ultra-Premium handcrafted tequila made from the highest quality 100% Weber Blue Agave aged between 10-12 years. Voodoo Tiki Tequila chooses only the biggest and sweetest agave, which are baked from 26-48 hours and the tequila is distilled twice. As the legend goes, Voodoo Tiki Tequila is aged in barrels carved from the lost, ancient and purportedly magical Voodoo Tikis. 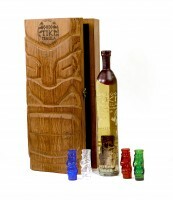 That is why every hand sculpted bottle has an actual glass Voodoo Tiki inside . Want to watch Alehandro Nuramo’s painstaking bottle making process live? Click Here to Watch Alehandro in Action. 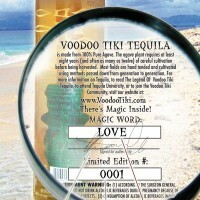 Every bottle of Voodoo Tiki Tequila is also glass etched, wax dipped, signed, numbered, and finally scribed with 1 of over 100 possible “Magic Words.” What’s up with the Magic Words? Read the Legend or watch the “Storyteller” animated version to find out. Click Here to Watch or read the Legend of the Voodoo Tikis. 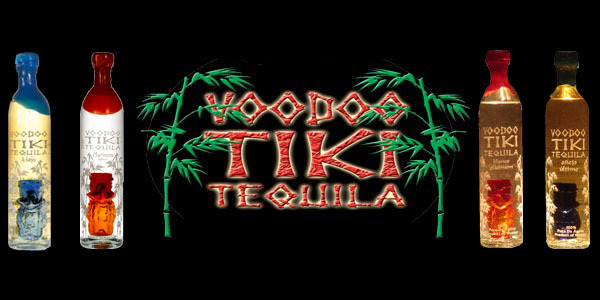 Voodoo Tiki Tequila offers a family of tequilas that appeal to everyone that wants to “Get Friki”, from the occasional tequila drinker to hard-core traditionalists and connoisseurs. We are a ultra-premium party tequila. 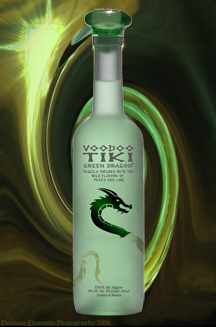 Voodoo Tiki Tequila is exciting, mysterious and fun. We like to say, “Just because your taste in liquor grows up, doesn’t mean that you have to.” Why is it that every premium brand feels the need to be so stiff, stoic and serious? We work hard to make sure that what we put in every bottle of Voodoo Tiki Tequila is the very best tequila money can buy (often 3-5x the manufacturing cost of many “Sacred Cow” tequila brands!) Voodoo Tiki is a fun, good time, lifestyle brand of ultra-premium tequila made for experienced taste buds, and hearts that love a party. From the birth of each bottle (blowing the glass) to the last sip, Voodoo Tiki is very special. Our agave plants are grown for a minimum of ten (most are twelve) years before being considered suitable for fermentation. The additional time and expense yields a more mature blue agave, with far better natural sugars. During this growing and cultivation period our plants are pruned regularly enticing the piña to reach a larger and sweeter state. Our proprietary cooking process allows the agave pina to process its natural juices most efficiently and avoid the buring and caramelizations found in other tequilas. Caramelization must be avoided as it adds darker and bitter flavors to the juice and reduces the overall herbal taste of the natural agave plant. Our slow cook process helps retain more of the natural agave flavor, sweetness and herbal plant quality. Voodoo Tiki Tequila is never rushed. Each lot of blue agave is frequently tasted during cooking to determine when the extraction is at an optimum. At that point, the pinas are pressed. The juice is fermented and distilled only two times to preserve the naturally sweet Voodoo Tiki Tequila flavors. The choice of agave from this rich soil region, the quality of workmanship and the Voodoo Tiki Tequila Family commitment of superiority to “Spare no Expense” in the production of this consistent, ultra premium tequila, combine to create remarkable taste and character which remains unmatched at any price. Recommended presentations: Neat for sipping, “On the Rocks” for sipping, Shots (served neat or chilled) and Platinum Mar-Tiki. 100% Blue Agave Silver Tequila is aged in oak barrels for 2-6 months. During that resting period the tequila’s bite relaxes and flavors breathe as the color begins to darken through absorption within the barrels. Sweet vanilla and caramel flavor with a light brandy finish. Smooth without a bite or aftertaste. Excellent for sipping. Recommended presentations: Neat for sipping, “On the Rocks” for sipping. Recommended: Classic Margarita, Rustic Margarita, Corona Margarita, Blackberry Lime Margarita and Mai Tai Margarita. 100% Blue Agave Silver Tequila is aged in oak barrels for at least one year. A very fine “Cognac” quality sipping tequila, or used in the ultimate mixed elixirs. 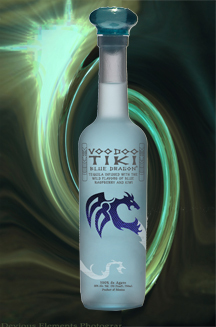 Voodoo Tiki Tequila is made with the finest, oversize ripe, sweet blue agaves. This incredible tequila is then aged a year (According to the legend, the year is in honor of Don Pedro. Legend has it that Voodoo Tiki Tequila is aged in barrels carved from Don Pedro’s Magical Tiki idols.) Cognac Brandy Taste With A Soft Brandy Finish. A very fine, sipping tequila or used in the finest mixed elixirs. MSRP is $999.99 Allocations will occur, and sellouts have led to significant price increases at the retailer level. reservations are highly recommended to avoid collector premium prices. Recommended presentations: The Ultimate Neat for sipping tequila. Perfect “On the Rocks” for sipping. Recommended: Neat for Sipping, Over ice, $500 Margarita. Also try Le’ Margarita de Artistes. Flavor Infusion – Voodoo Tiki’s flavoring process provides the consumer with the flavor process they would receive had they soaked fruits for weeks in their tequila. Our flavored tequilas are not the overpowering “Sugar Water” blends that you find in rums and the recent rash of flavored tequilas. 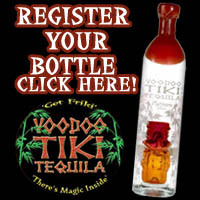 Voodoo Tiki’s Flavor Infused Tequilas offer a unique sweet fresh flavor without the hassle or time required to soak infuse tequila. For years People have searched the desert and soaked the pulp of prickly pears in tequila to create a taste infusion. The delicious and life giving prickly pear. Often referred to as “desert rose” has a unique. Sweet and tangy flavor that makes it the perfect choice for the tastiest margarita ever! Recommended presentations: Neat for sipping, “On the Rocks” for sipping, and anytime the ladies want to “Get Friki”. Recommended: Prickly Pear Margarita, Desert Rose Mar-Tiki, Tiki’s Revenge. The Fresh Taste of rare blue raspberry and mouth watering green kiwi infused directly into our premium blend tequila. A fresh fruit experience that will awaken your mind and your taste buds will never forget. It’s an incredible tequila martini selection. Recommended presentations: Neat for sipping, “On the Rocks” for sipping. Delicious with 7-Up on Ice. Recommended: Blue Voodoo Doll (Award Winner), Blue lagoon Mar-Tiki, Gummi Bear Margarita, Carnival Cotton Candy, Many Candy Margaritas. The Delicious taste of peaches and lime infused directly into our premium blend. Perfect for shots, shooters and frosty lime flavored concoctions. Recommended presentations: Neat for sipping, “On the Rocks” for sipping, Use in any “Traditional” tequila cocktail for an added burst of flavor . Recommended: Peach Lime Margarita, Mojito Mar-Tiki. 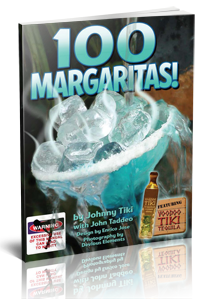 Download the Voodoo Tiki Margarita Guide 100 Margaritas! now! Click Here.